The PB&J Campaign was created by Bernard Brown as a way to protect the environment by reducing the amount of animal products people eat. While beginning as an online campaign, it has grown into a grassroots effort with community outreach events (including AWFW) on PB&J Day (April 2nd) and year-round. It’s easy to get active – join AWFW & PB&J. It’s easy to get active with PB&J. You can set-up a table outside, at events, or your local store. 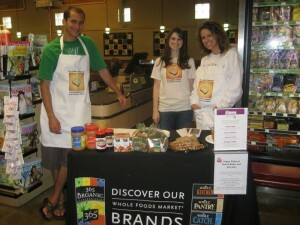 We have free handouts and you can visit The PB&J Store for t-shirts, stickers, and apron (as seen above). Replace jelly with different flavored preserves or whole fruits (such as bananas or apples). Try different types of nut butters (almond, cashew, hazelnut, and others). There’s also great seed butters (sesame, sunflower, and pumpkin). Update the white bread of yesteryear with whole grain breads, crackers, or use nut and seed butters directly on fruits and vegetables. Want a hearty breakfast? Add them to bagels or English muffins. 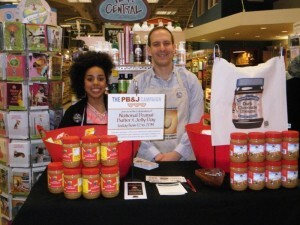 I came across The PB&J Campaign through our Sustainable Keys Global Grants program. They were one of our first award winners. Since then, we’ve worked together in a variety of ways, and in 2011 we officially adopted the campaign. Now one of my favorite meals or snacks is a peanut butter sandwich with apple on the side. I use an organic, natural peanut butter (smooth not crunchy) on whole wheat bread. The peanut butter is high in protein with no added fat or sugar (like conventional brands). The apple provides additional vitamins and fiber with just the right amount of sweetness. For an added boost, I add chia seeds (yes, those chia seeds). So that’s my favorite… what’s yours? 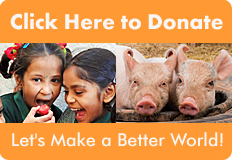 E-mail pbj@awfw.org and let us know.